Today we will discuss a few questions (MCQ) involving kinematics and elastic collision. The first four questions are relevant to AP Physics B as well as AP Physics C while the last question is relevant to AP Physics C.
(1) A particle moves from point A to point B (Fig.) in 2 seconds, covering three quarters of a circle of radius 1 m. What is the magnitude of the average velocity of the particle? The displacement of the particle during 2 seconds is equal to the length of the straight line AB. 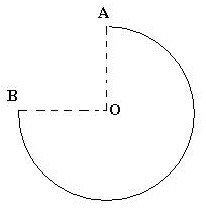 Since OA and OB have the same length of 1 m, AB = √2 m (length of the hypotenuse of the right angled triangle AOB. s = ut + ½ at2 with usual notations. This gives t = 1 s.
1 s +1 s = 2 s.
(4) In question No.2 suppose the inclined plane is not perfectly smooth, but offers a small frictional resistance. The object slides downwards from point P and collides with the block elastically after time t1. It then slides upwards and momentarily comes to rest after an additional time t2. Which one among the following statements is correct? During the downward trip the acceleration has magnitude less than g sinθ since the frictional force opposes the motion of the object. In solving question No.2 we have found that the time for the downward trip is 1 second when the downward acceleration has magnitude g sinθ, appropriate to the case of a perfectly smooth incline. Since the magnitude of the downward acceleration is reduced in the case of an inclined plane that offers frictional resistance, the time required for the downward trip is increased. During the upward trip (after colliding with the block) the deceleration has magnitude greater than g sinθ since the frictional force as well as gravity oppose the motion of the object. The object therefore comes to rest in a shorter time. Therefore t1 is greater than t2 [Option (e)]. [When you project a ball up, the time of ascent will be equal to time of descent only if the air resistance is negligible. If the air resistance is not negligible, you will find that the time of ascent is less than the time of descent]. At the instant of collision the large block moves up the incline with velocity 2 ms–1. (Let us take this direction as positive). Or, u1 = 2 ms–1. This gives v2 = 9 ms–1. 2–2 = 0 and –5–2 = –7. Just after the elastic collision, the velocity of the object becomes 7 ms–1 relative to the block which we kept at rest for the convenience of argument. Our frame of reference is to be brought back to the ground. For this we add a velocity of +2 ms–1 to the block and the small object and obtain the velocity of the block as 2 ms–1 (0+2 = 2) and the velocity of the small object as 9 ms–1 (7+2=9)].